We were met at the gate by two wide eyed boys, Samwel and Ashenafi. They are close friends, ages 8 and 9, who are being adopted together to Chicago. They are not blood-brothers, but did come from the same village, lost their parents at about the same time, and spent more than 2 years together in the orphanage. They have seen others come and go, while they grew older and harder to adopt. You might think that they would be hardened by an experience like that, but we’ve found quite the opposite. 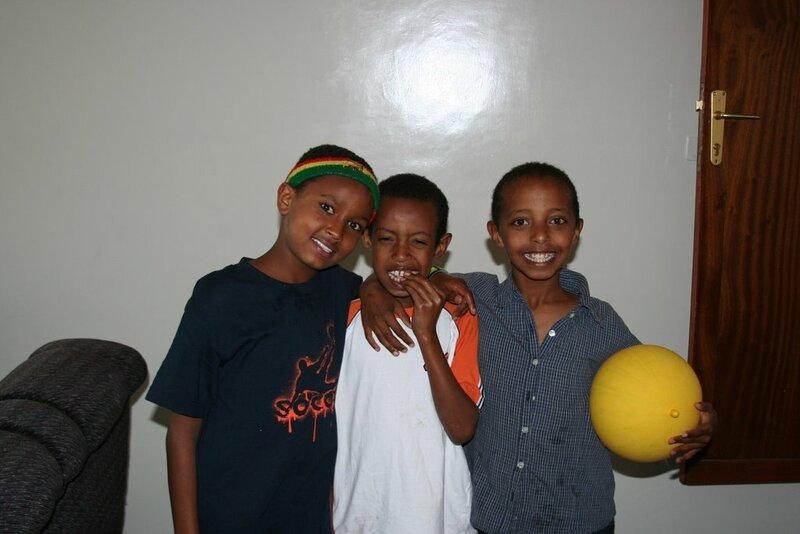 They are the most welcoming, sweet, hospitable young boys you could imagine. We hadn’t even started unpacking and two of them were making us eggs and tea. We sat while they served us, two weary travelers being blessed at the hands of two orphans not even 10 yet. We talked while the two of us ate our “snack.” They had known Manyazewal at the orphanage, and were excited that he would be coming to the guest house so that they could play together. Our eggs consumed, they finally released us to unpack while they did our dishes for us. Then they said goodnight and were on their way back up to their room while we settled in, already feeling at home.